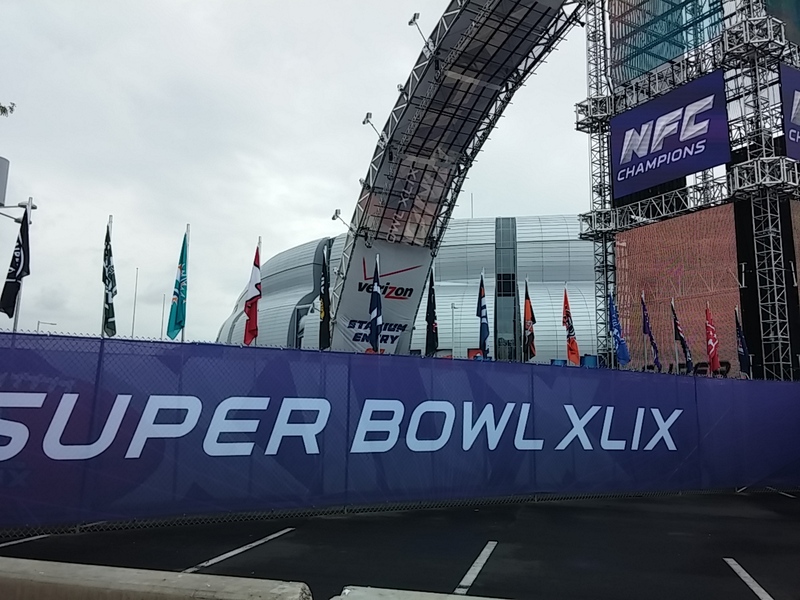 We went for a drive and walk around the Super Bowl area this morning. First visual clue we were getting close? 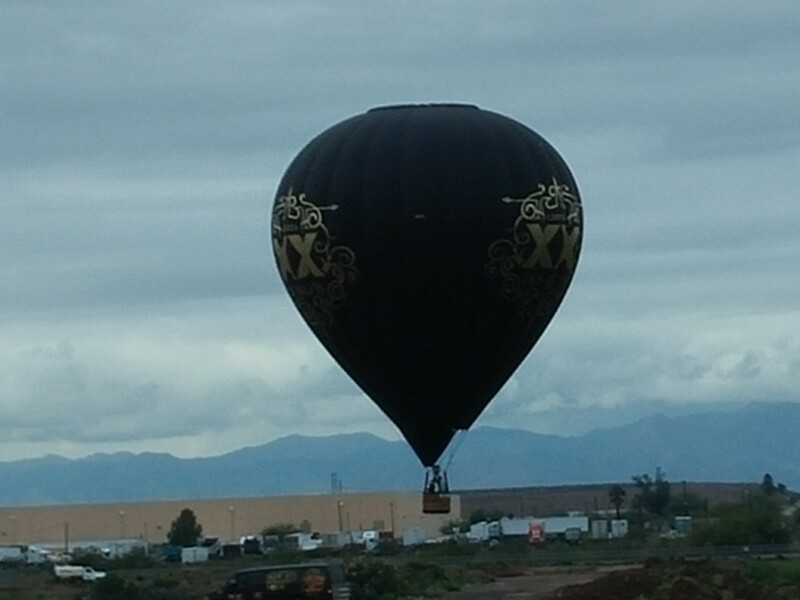 The Dos Equis hot air balloon coming in for a landing. Second clue? 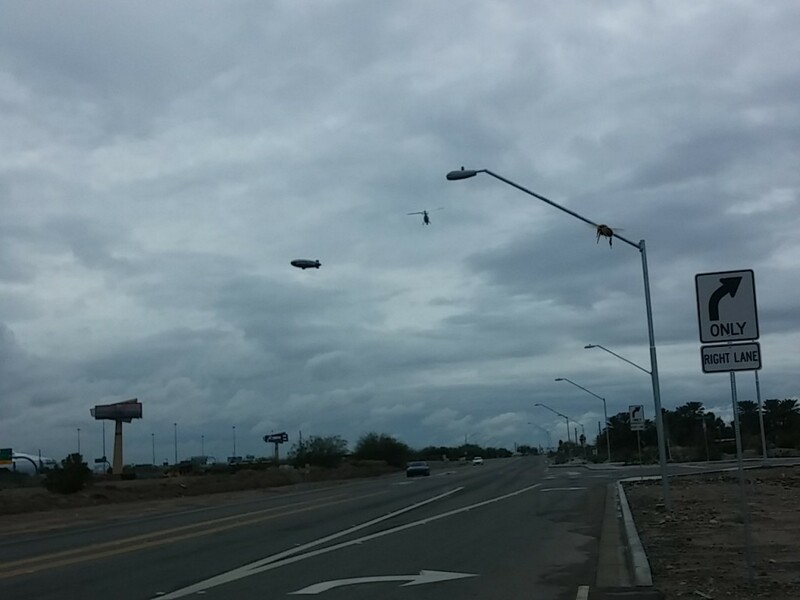 A blimp and an airplane with a banner flying around. That’s the Goodyear blimp and advertisement for Uncle Henry’s Fly N High Cannabis Store. 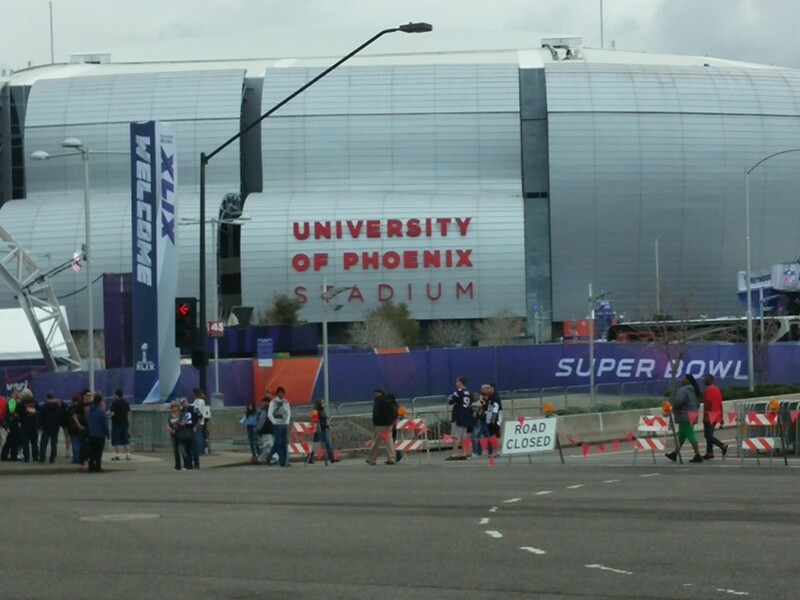 The University of Phoenix Stadium. 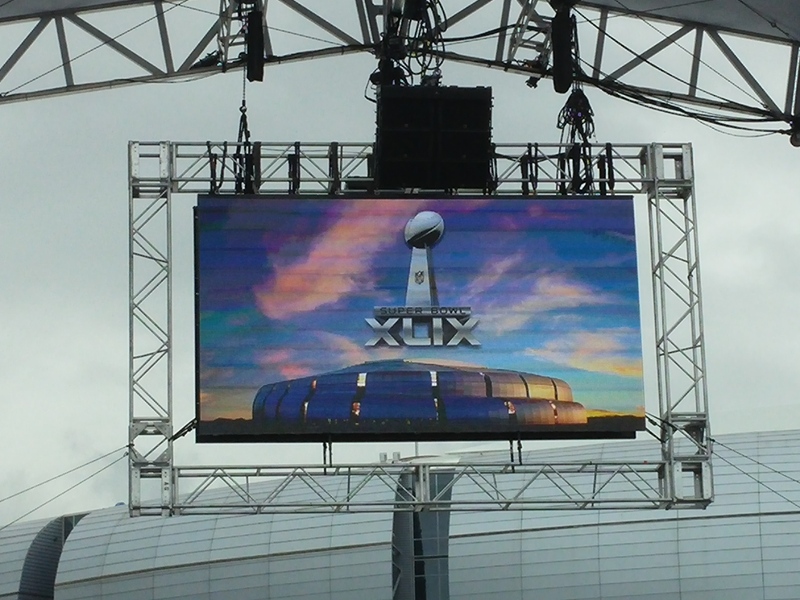 The parking lot around the stadium has been inundated with decorations and technology. There are at least a dozen announcing booths set up with the stadium in the background. Lots of people are trying to buy tickets. 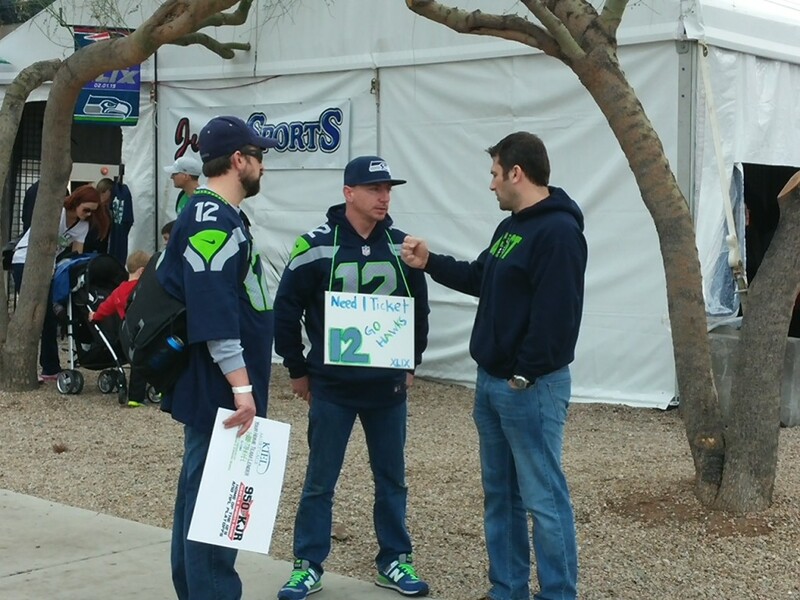 Seahawks fans outnumbered Patriot fans fifty to one. 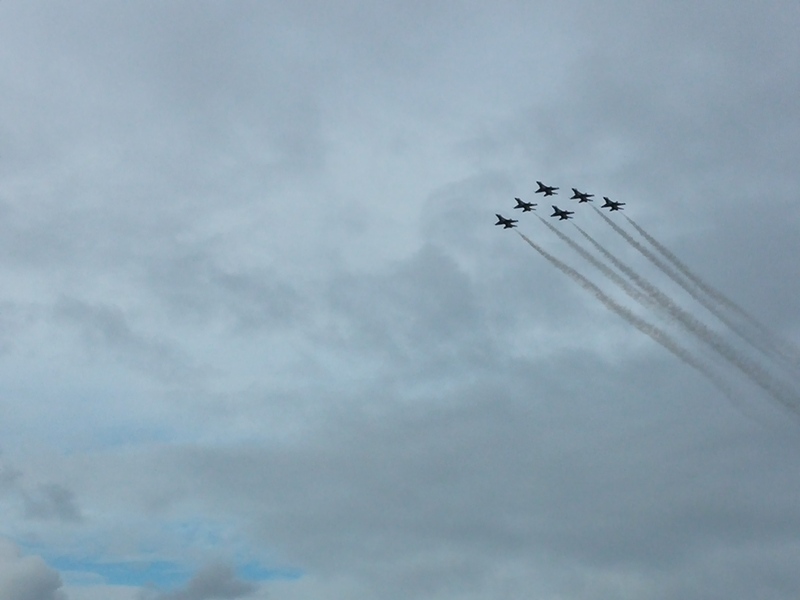 The Air Force Thunderbirds practiced their fly over several times. 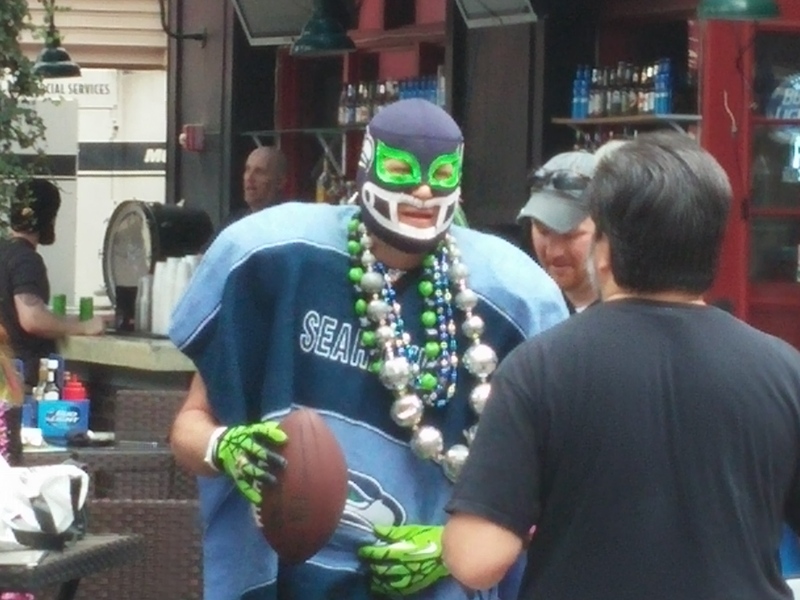 Seahawk fans go all out. 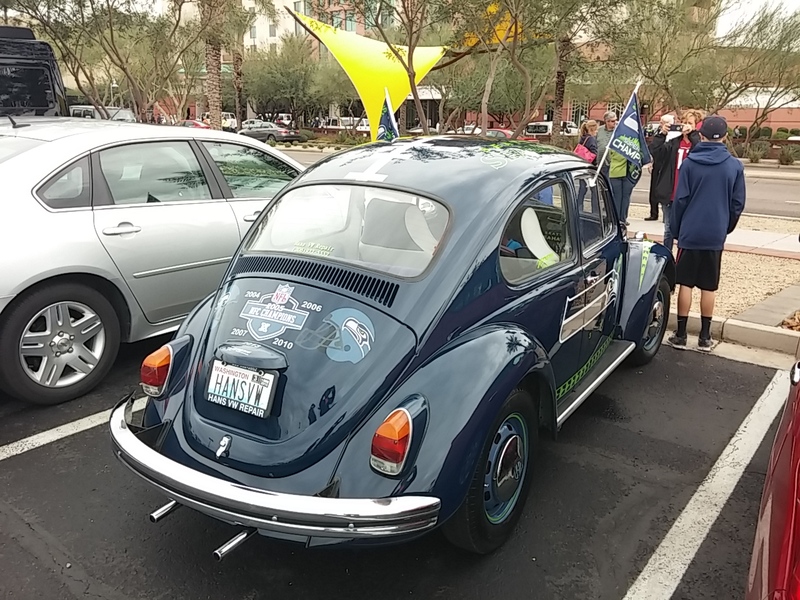 This car is from Seattle, and the owner of the VW repair Shop who owns the cat had it shipped down for the game. 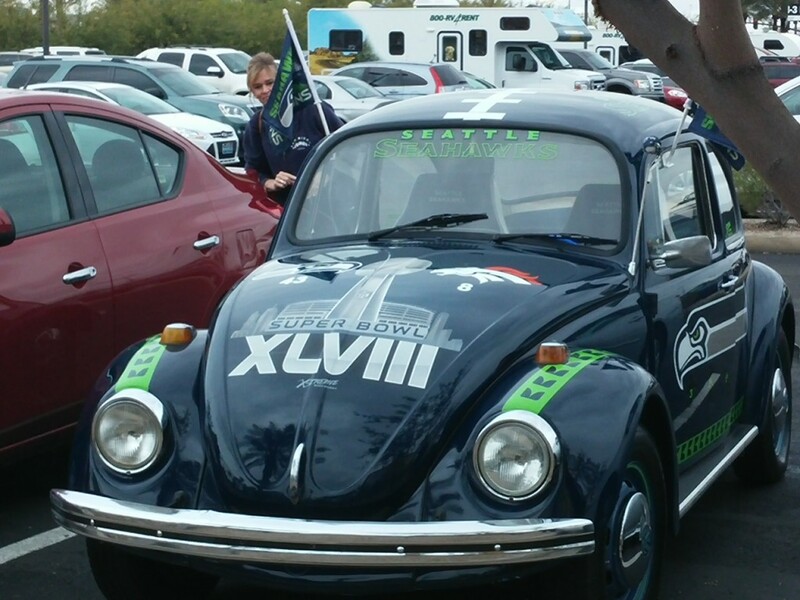 I’m guessing he’ll have it updated for Super Bowl 49 if they win again this year. 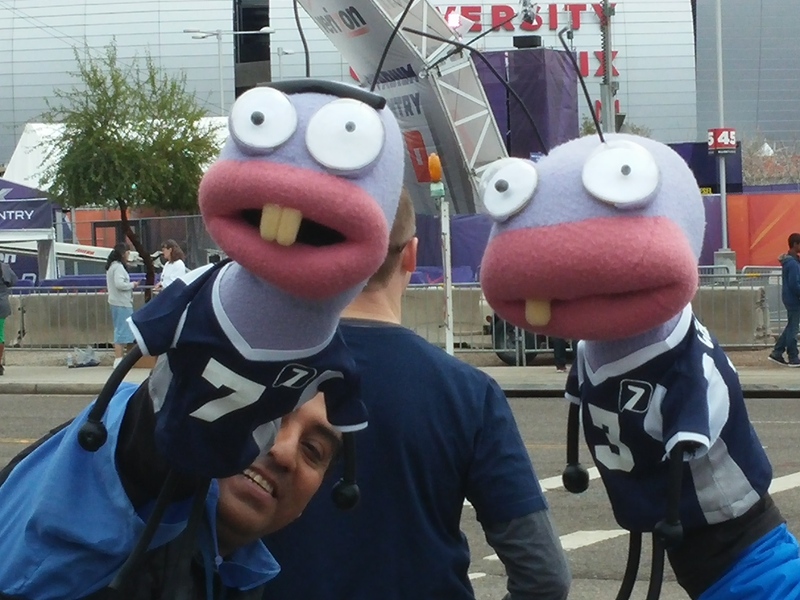 I have no clue who these puppets are. They were speaking in Spanish way too fast for me to catch their names as they were being filmed. 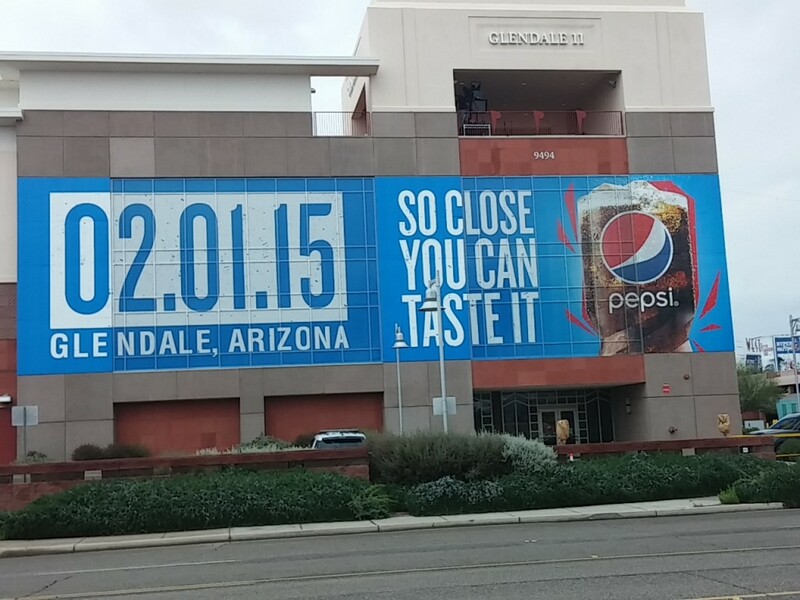 Everything in the area was super sized including this ad for my favorite drink. 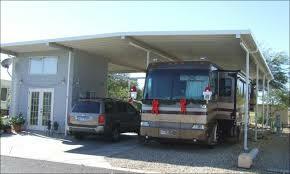 Luke Air Force Base is located just down the street aways from our RV resort. 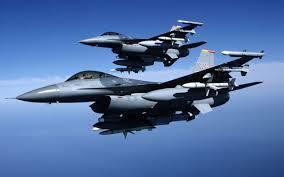 The base is an active-duty F-16 Fighting Falcon training base with 170 F-16s assigned. 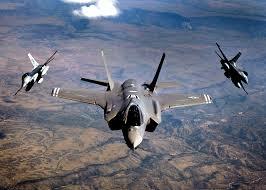 It also houses a total of 144 F-35A Lightning IIs. The airpower these jets provide is amazing and impressive. They fly Monday through Friday from 7:30 am to 9:30 pm. 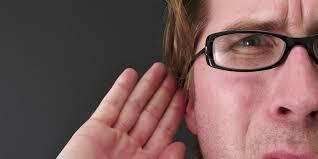 The noise they make can be overwhelming. When they fly over during pickleball, we sign the scores. Rich and I don’t even try to talk when they start flying over. We just count aircraft to four because that’s how many take off during each round. Once we count to four, we’ll try to start talking again. Sometimes I am surprised at how little Rich and I are spending on this journey compared to what I thought it would cost. Sure, we have the huge expense of buying Homer. 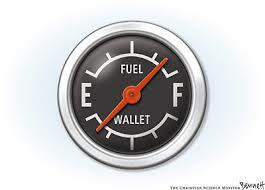 And then there is the cost of diesel to move from place to place. Homer gets a whopping ten miles per gallon. But motor home insurance and registration have been less than we anticipated, and there are a lot of standard expenses we don’t have because we’re homeless: no property taxes, no utilities bills, less than half the auto insurance because we’re down to two cars and one is in storage. All that being said, we are still incredibly tight with our money on some stuff. 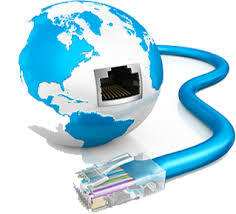 Case in point–we are struggling with paying extra for Internet. I started looking at our resort neighbors and most of them golf once a week. And good for them. So I got to thinking, I don’t golf and pickleball doesn’t cost me anything for my daily sweat. What if I pretended I golfed and applied my golf round money toward my Internet cost? Problem solved. Now I have no problem paying for Internet. The Phoenix area is bustling with oodles of sporting events this week. 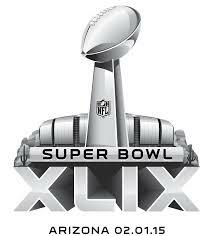 The NFL Super Bowl is in Glendale, about five miles from us as the crow flies. 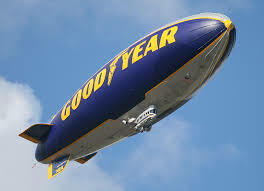 We have been watching the blimps hover over the stadium all week. 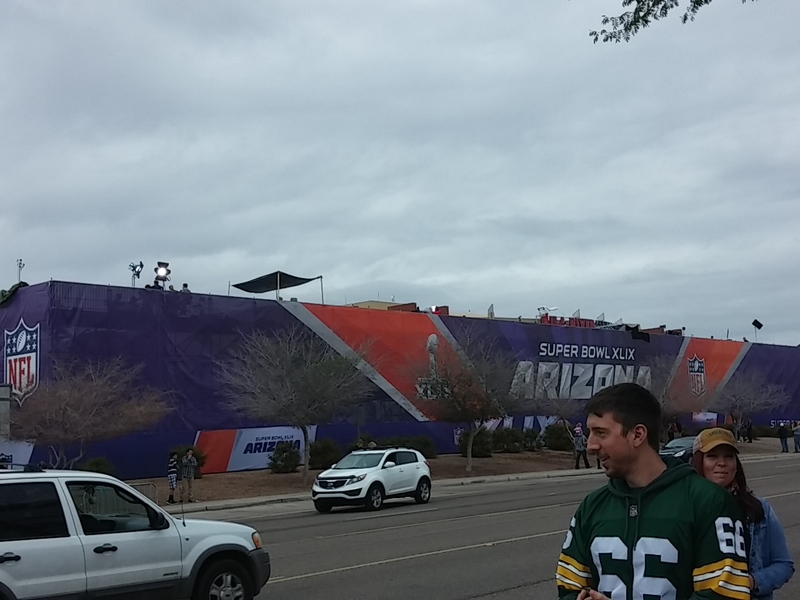 There are some activities at the stadium and some activities in downtown Phoenix all week long. 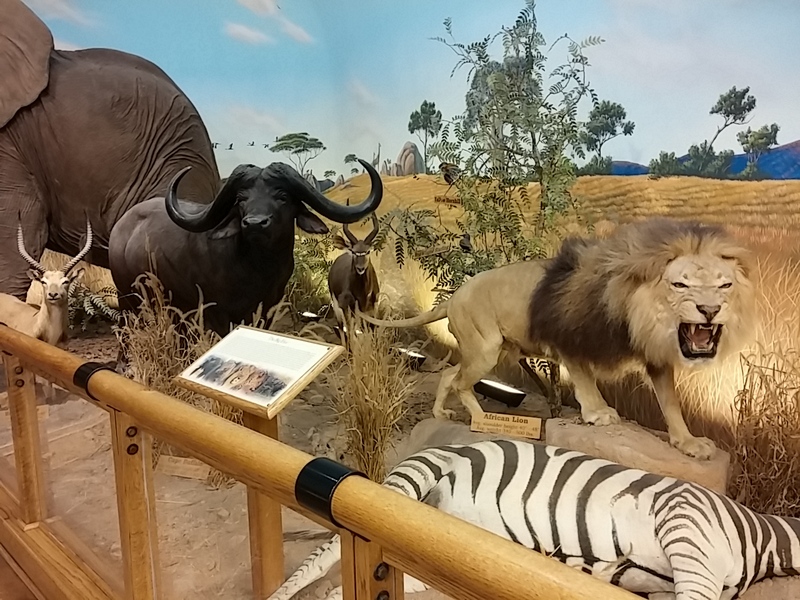 Over a million people are expected to visit at least one of the activities this week. 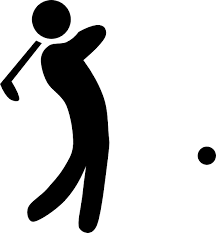 Also happening in the area this week is Tiger Woods’ return to the PGA circuit at the Waste Management Phoenix Open held in Scottsdale. 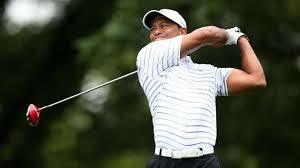 It’s his first time at the Open since 2001, and it’s his first big tourney since back surgery last year. Over 500,000 people are expected to watch the tournament in person. 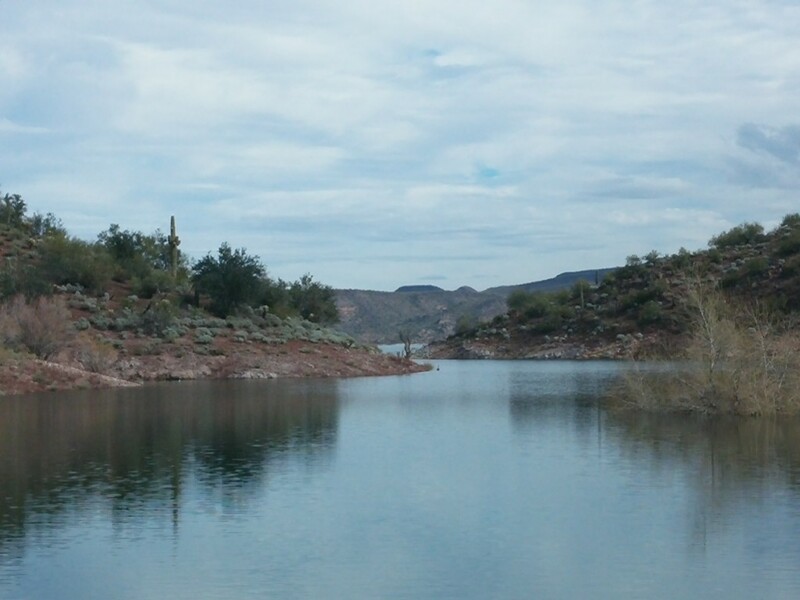 We went for a drive to Lake Pleasant yesterday. 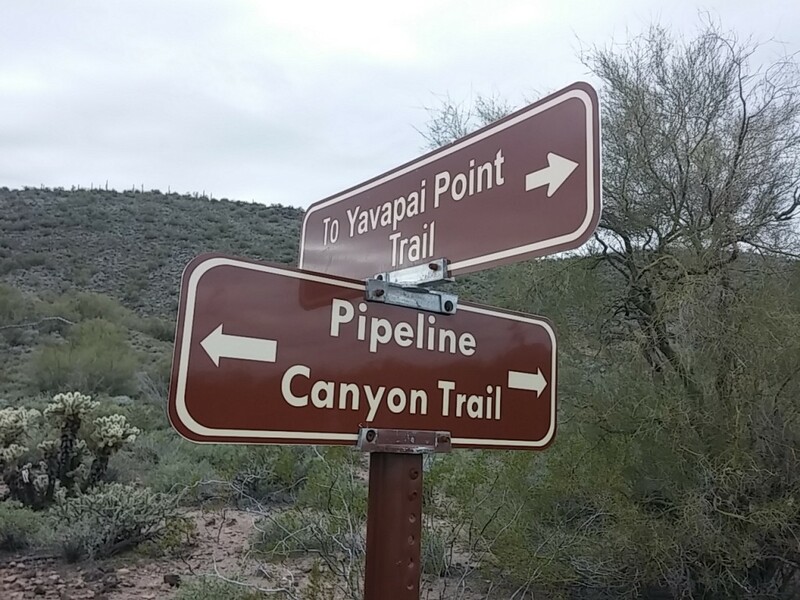 It’s a beautiful area with a manmade reservoir and lots of trails. So we went for a hike on Pipeline Canyon Trail. It’s lovely. 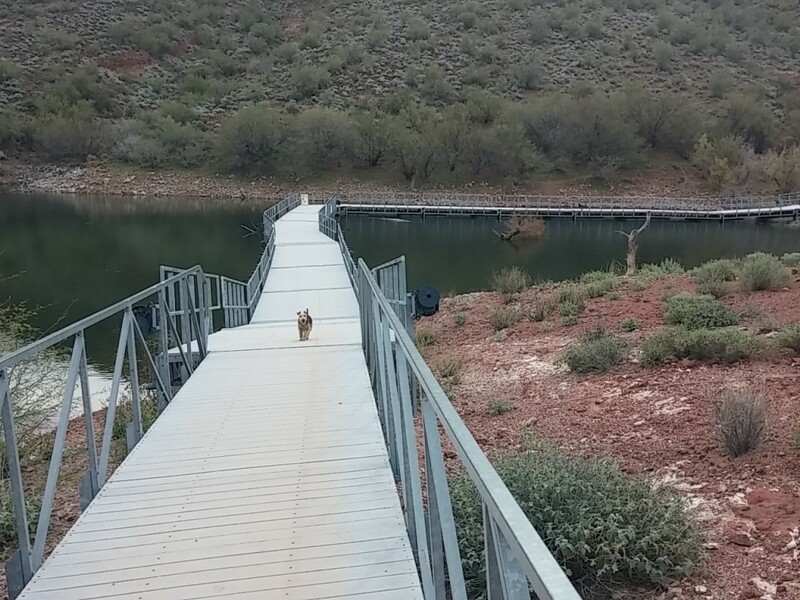 Sophie especially liked the bridge that crossed part of the lake. And she really liked the lake… So much so that she jumped right in for a swim on the way back. We ran into a couple who were also from Boise (It’s a small world!) 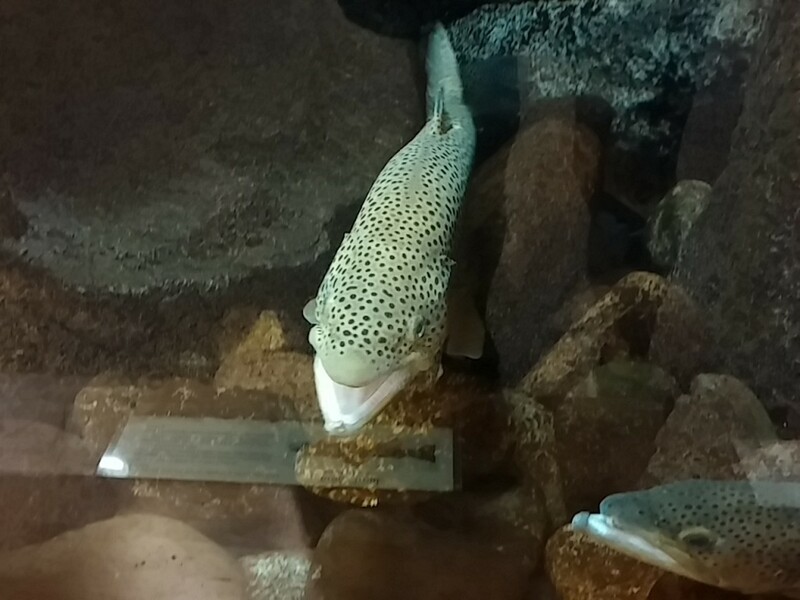 and had a nice chat. They stay at Army Corp of Engineer and municipal parks as they travel. Those can be cheaper alternatives and easier to get in to. 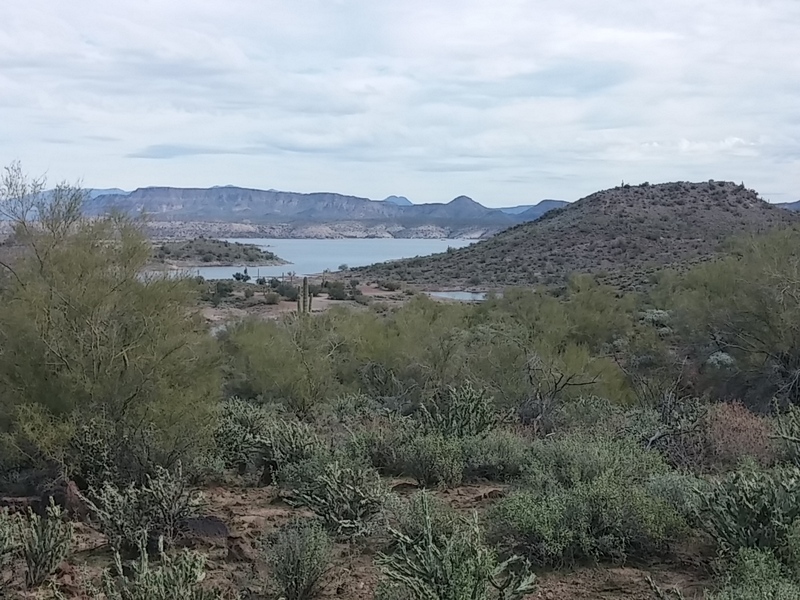 I’m continually surprised at the amount of water and greenery in Arizona. 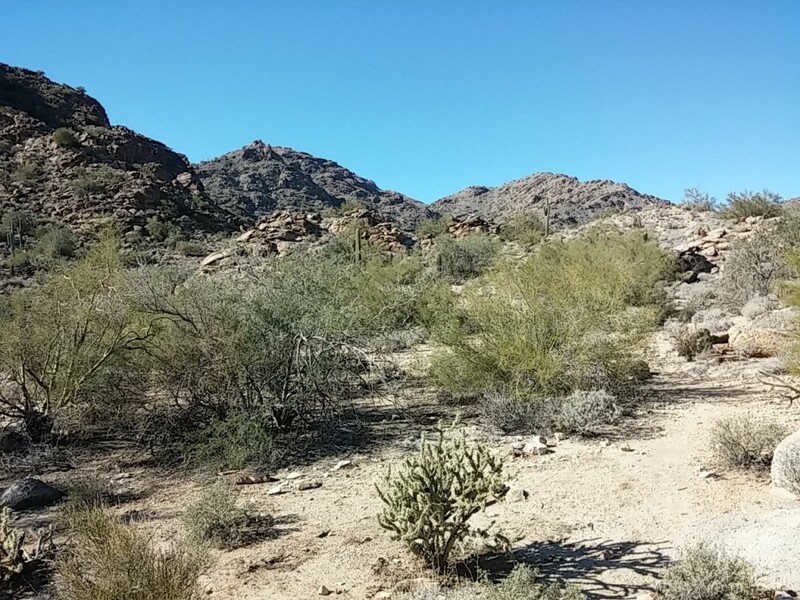 I’m sure the water is just because of the places we choose to visit, but the green-tinged desert is everywhere. 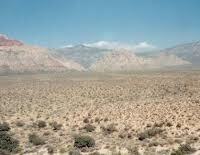 People from non-Nevada areas think the Arizona desert is barren, but if they just took a look at Nevada desert they’d see what we mean. The best part of our hike came at the end. 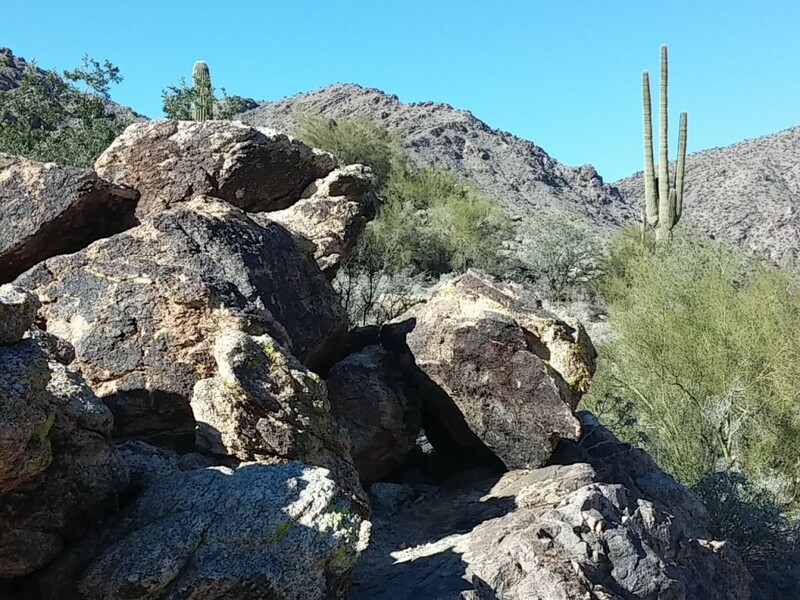 We heard and then saw five wild burros! 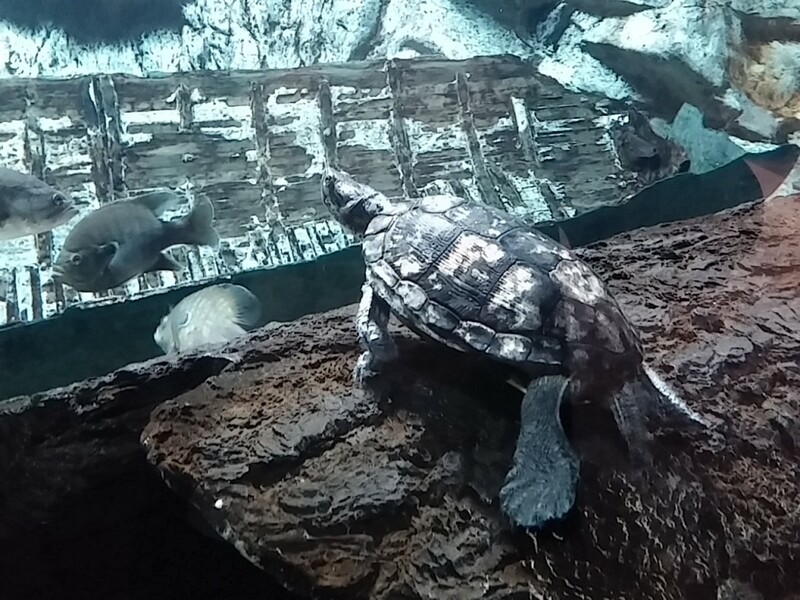 They were too far away for a picture opportunity, but we got a great look at them with our binoculars. 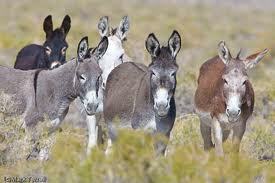 I had no idea that burros came in so many different colors. We didn’t see a red one, but we did see black, white, and grey. I am trying to change the way I process and deal with things. I’ve been stuck in an endless loop of second guessing and over analyzing my decisions, internal thoughts, and communications with others. 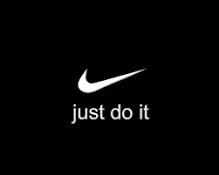 I now have the Nike swoosh imprinted on my brain, and repeating Nike’s slogan JUST DO IT! has become my mantra. 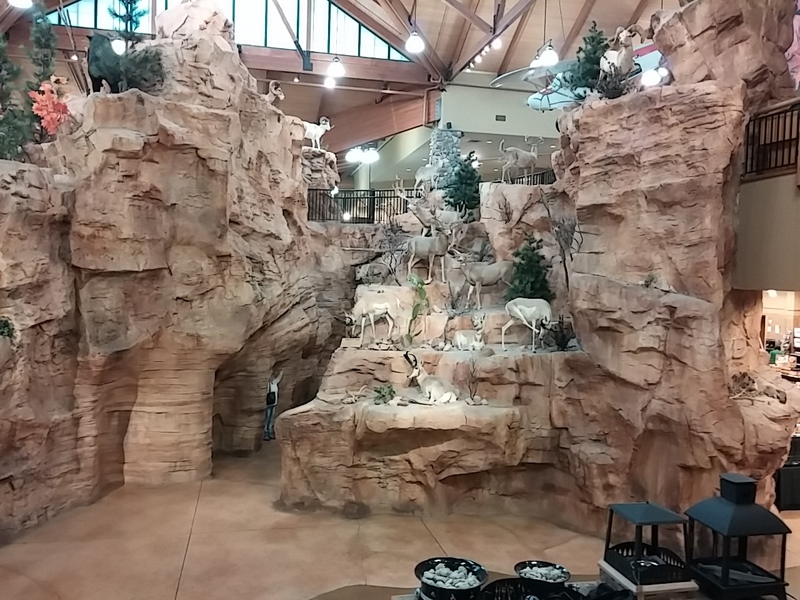 We recently visited a very unique 55+ resort in Surprise. It’s called Happy Trails Resort. 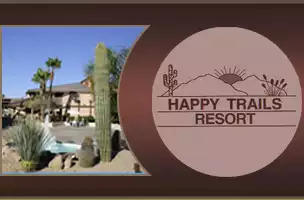 What makes Happy Trails so unique is that each one of the nearly 2000 lots is individually owned and not owned by a corporation that rents or leases out to individuals. In all of the other resorts we’ve been in, less than 5% at most of the lots are owned by individuals. 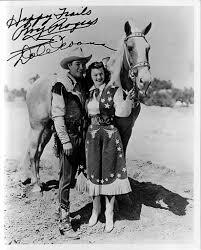 Because lots are individually owned, people put more of their own personal touches on them. 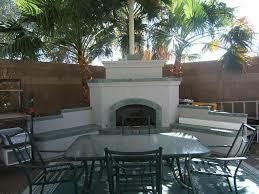 Some of the outdoor kitchens were amazing. 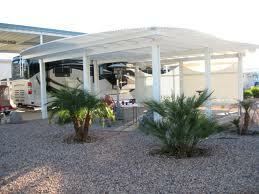 And nearly all of the lots have full shade including over motor homes to protect them from the desert sun. Many have two story casitas that have a washer and dryer, full bathroom, and extra storage. Happy Trails is an intriguing and inviting community with dozens of activities and amenities. When all of us Baby Boomers die off, the next generation isn’t going to understand the street names. 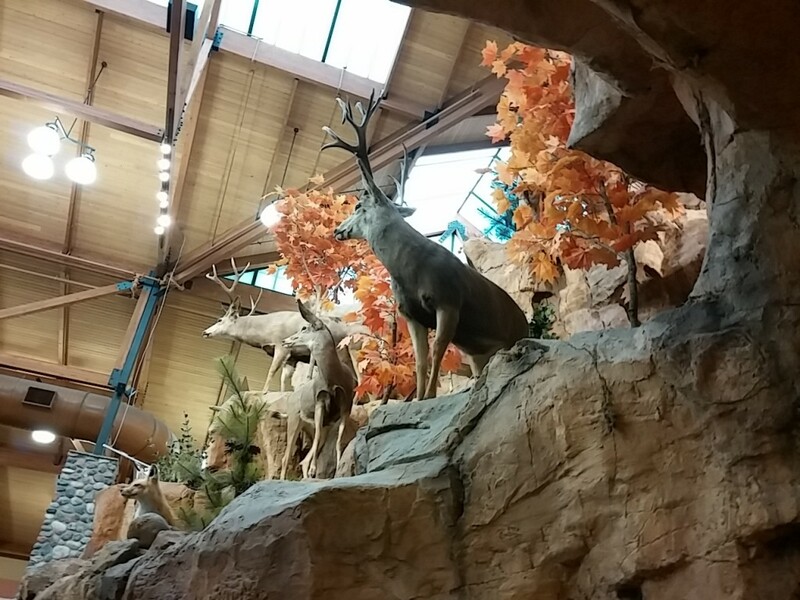 We visited Cabela’s in Glendale the other day. 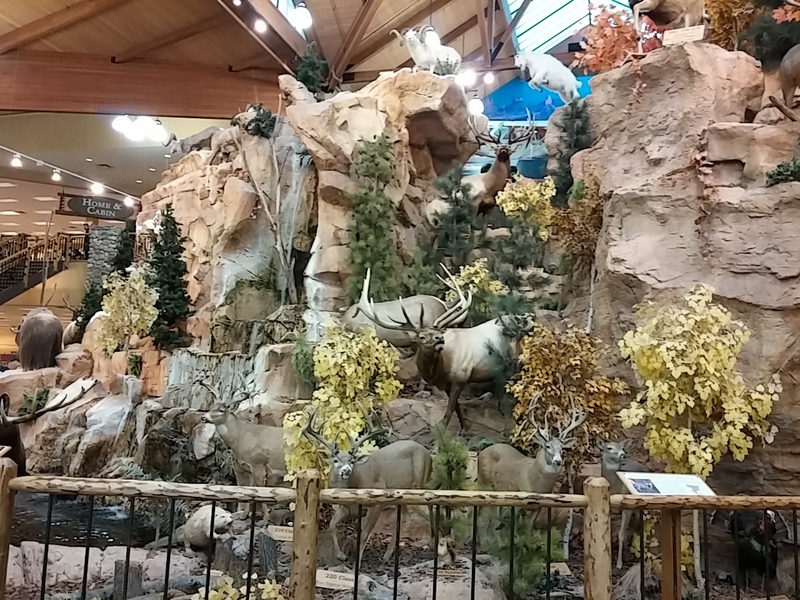 It’s a colossal store with over 160,000 square feet of retail space. 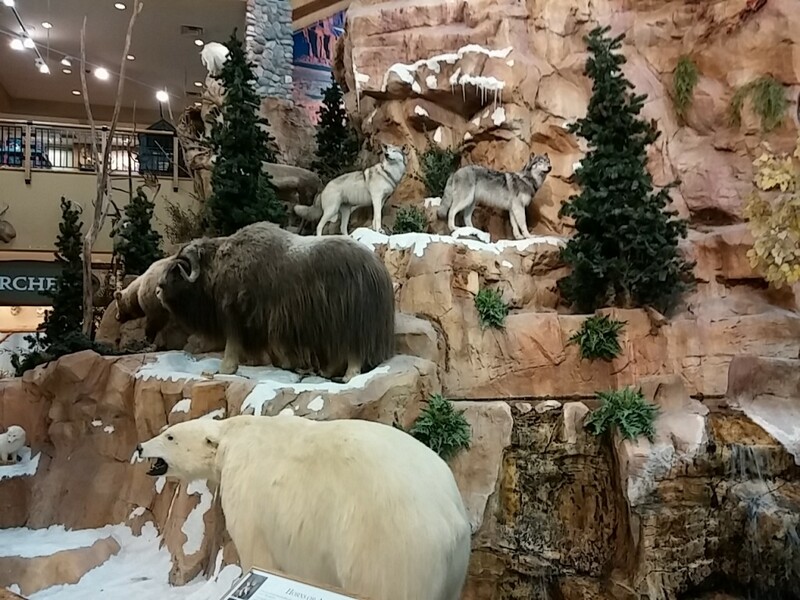 While the store size is amazing, the wildlife display is the focal point of the entire store. 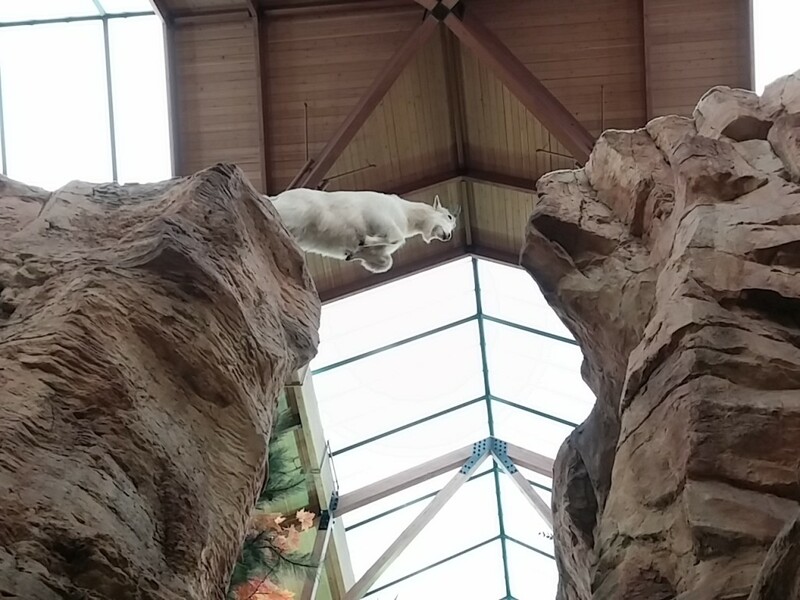 Many of the animals are shown in action like this mountain goat jumping across from one rock to another. The mountain is two stories high with animals ranging from bears to wolves. You can get an idea of the mountain’s height by comparing it to the woman in white (with her arms raised) standing at the bottom of the canyon walls . 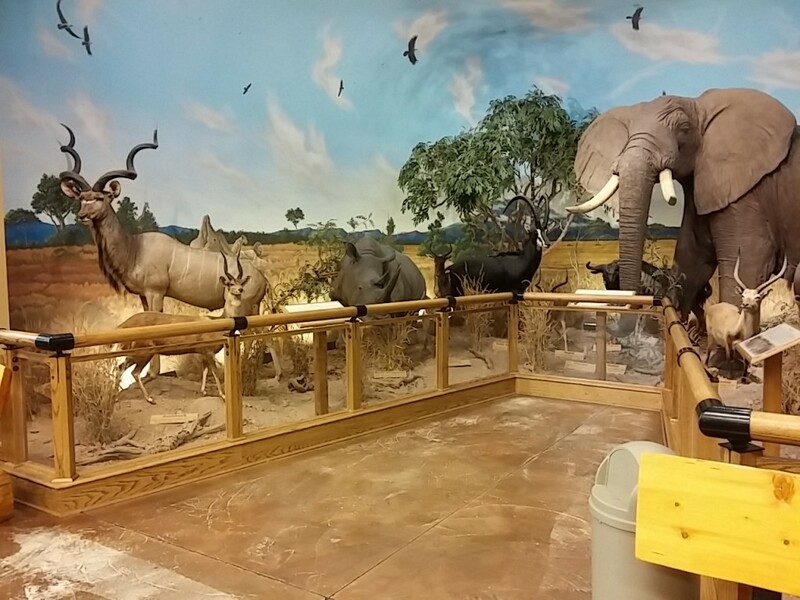 Because most hunting is done in the fall, the scenery shows the animals during hunting season. Another section of the store shows African safari animals. 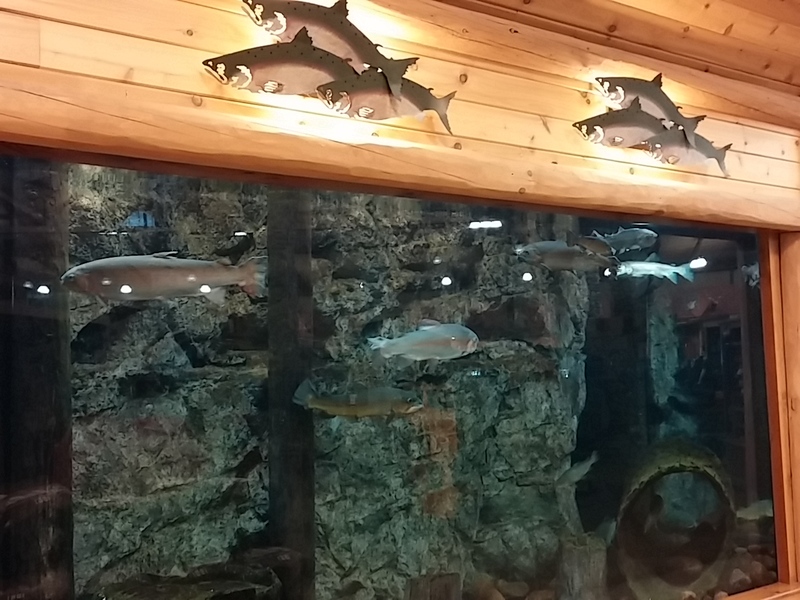 And just to make marine lovers feel at home, there is an extensive aquarium. 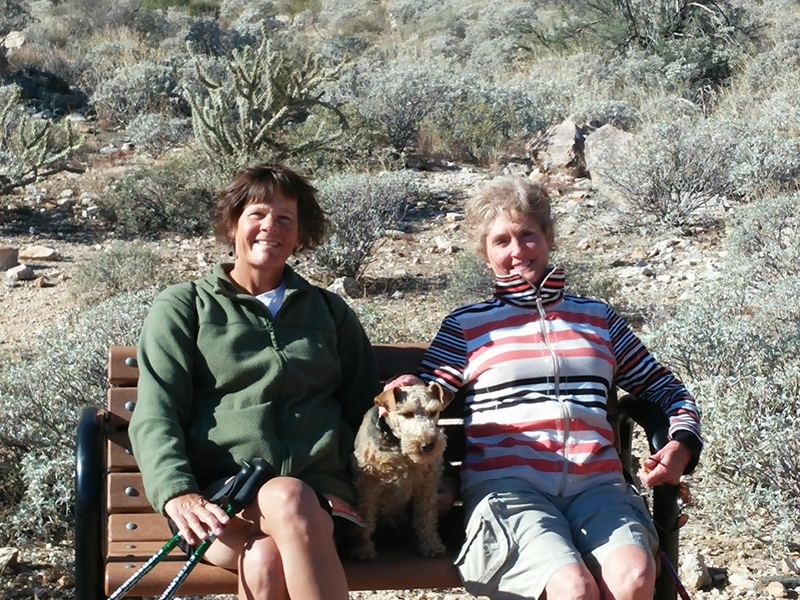 We went for a fantastic hike yesterday with Dean and Lil in Ford Canyon located in the White Tank Mountains. 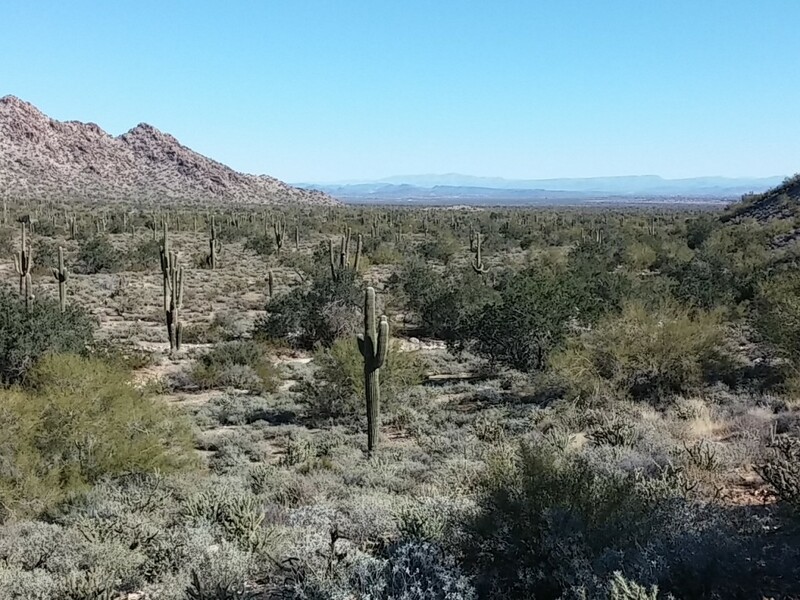 The views of the Valley of the Sun were amazing with hundreds of saguaro cacti looming large. Happy hikers, one and all. 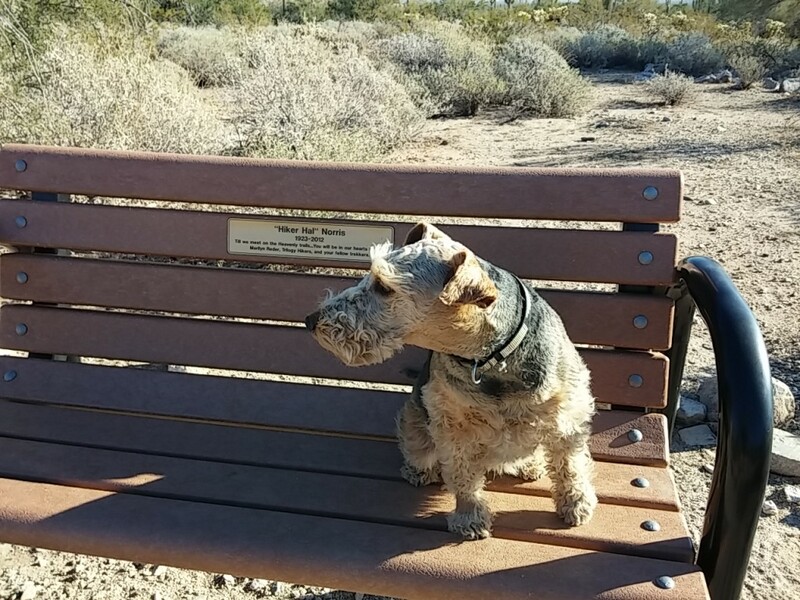 I love looking at dedications on park benches. 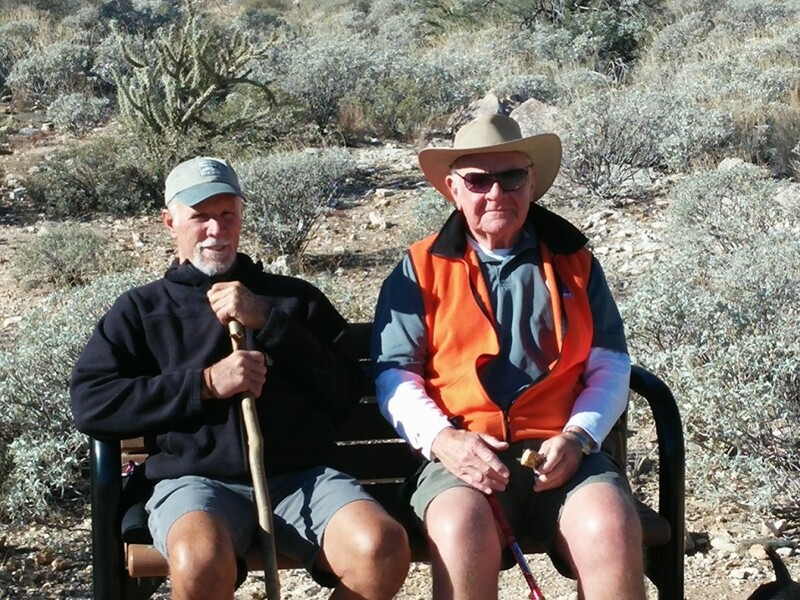 This bench is dedicated to “Hiker Hal” Norris. For Christmas I received a great gift from my wonderful friend Sharon. 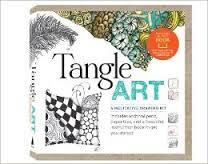 Tangle Art: A Meditative Drawing Kit contains everything you need to get started in the playful and inspiring world of tangle art. 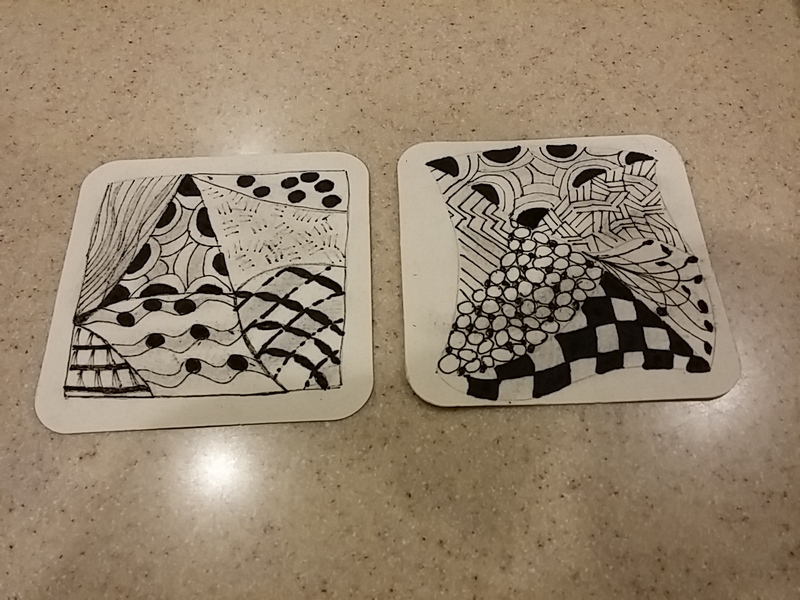 Also known as Zen doodling, tangle art is a popular trend that involves drawing repetitive lines, marks, circles, and shapes. Each mark is called a “tangle,” and you combine various tangles into patterns to create “tiles” or small square drawings. It is a fun, relaxing way to improve focus, spark creativity, and develop artistic confidence. I just started tangling a few days ago, and I am really enjoying it. The kit comes with everything needed to start tangling including detailed instructions for those of us who are scared to make a mistake and therefore delay starting new projects. I’ve only done a few tangles on paper tiles that came in the kit, but I’ve noticed that I’m feeling more confident each time I tangle. All that being said, comparing my tangles to Sharon’s show that artistic ability counts. Sharon’s an amazing artist in multiple mediums. 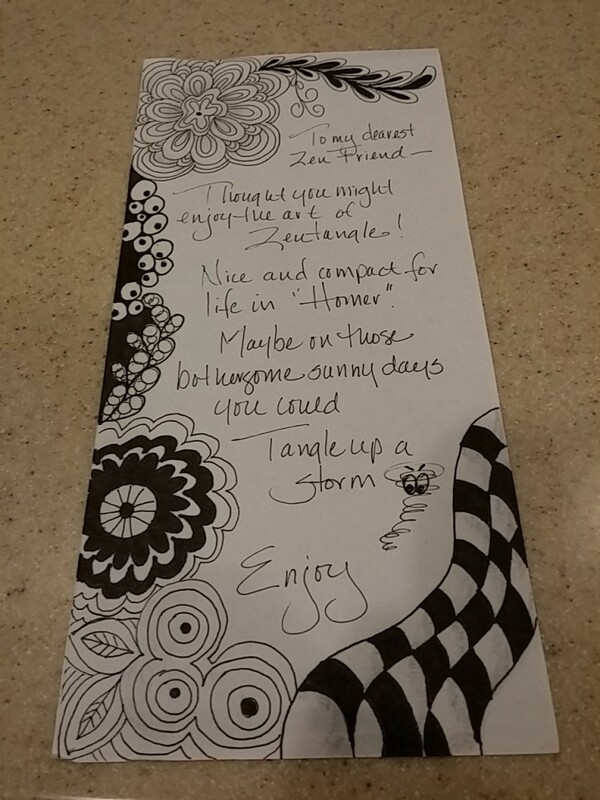 Thank you, Sharon, for the wonderful gift!